While Brendan Shanhan has doled out 26 regular-season suspensions — which some think have gone too far, hits targeting of the head continue. The face of the NHL, Sidney Crosby, lasted just nine games in his latest comeback before being sidelined yet again with post-concussion syndrome. His return to the ice and excellence is still uncertain. Even worse, a season after seeing three of its enforcers die in one summer, the NHL faces mounting questions about player safety. Some players, celebrated for their toughness, bristle at league mandates regarding concussions. One such example came on December 17th, when the Toronto Maple Leafs’ Colby Armstrong suffered a concussion after colliding with Vancouver’s Ryan Kesler. However, Armstrong did not report the concussion, choosing instead to hide his condition from trainers, who discovered it only when they found Armstrong vomiting in the locker room. While no one would question Armstrong’s toughness and grit, this is the last place that an NHL player should be expected to show his bravery. Below the jump, we’ve chosen to highlight 12 All-Star caliber players — six each for the Eastern and Western Conferences — who’ve struggled with head injury this year. We hope that this brings attention to concussions in sports and specifically in hockey, where the problem has grown too big to be ignored. Story: Mike Richards took a Sean Bergenheim shoulder to the head on December 1st. He went to IR on the following day and missed eight games with a head injury. Bergenheim did not receive any supplemental discipline. Story: One of three Kings’ star forwards to suffer concussions this season, Kopitar was injured on a hard hit by Dallas Stars power forward Brenden Morrow behind Dallas’ net. Kopitar left the game for precautionary reasons, but thankfully for Kings fans, did not miss a single game afterward. Story: Taylor Hall took a Corey Potter skate to the face in warm-ups before a game against the Blue Jackets, and it didn’t look pretty. 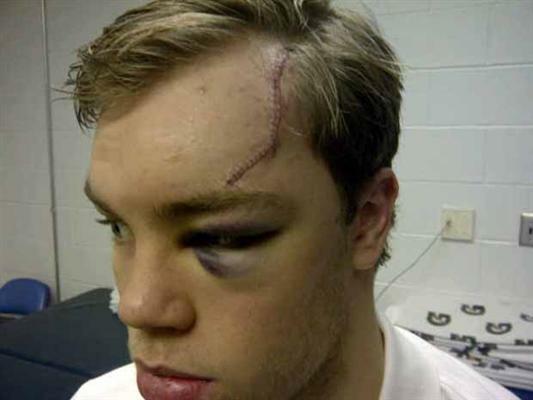 Hall only missed two games – one against the Blue Jackets and the next against the St. Louis Blues. Story: Shea Weber, the Nashville Predators hard-shooting All-Star defenseman, took a forearm to the head from the Dallas Stars’ Mark Fistric and missed four games with “concussion-like symptoms.” No penalties were called on the play, nor did Brendan Shanahan suspend Fistric, who had already been suspended that month for an illegal hit on Islanders forward Nino Niederreiter. The hit on Neiderreiter also resulted in a concussion. It’s understandable that you don’t want your opponents to know that you won’t fight. Keep the secret to yourself. You don’t have to disavow fighting publicly. Just don’t fight. You have too much to risk and too little to gain. Story: In one of the most controversial hits this season, Brad Marchand caught Sami Salo with what seemed to be a borderline hit somewhere between a hip check and a clip. This earned Marchand a lengthy suspension from Brendan Shanahan, missing five games; Salo is yet to return. “I’m lucky I didn’t break my neck,” Salo said Friday, answering questions for the first time since landing heavily on the back of his head and neck when upended by Marchand during the Canucks’ 4-3 win in Boston two weeks ago. “You can’t play the game thinking about what other guys might do. You can’t play the game… thinking this guy might elbow me or something. Story: Minnesota goaltender Josh Harding was accidentally elbowed in the head by his teammate, Nick Schultz, while battling with the Sharks’ Joe Pavelski in front of the net. The elbow left Harding with a concussion. He became the fourth Wild player to suffer from a concussion this season joining Guillaume Latendresse, Marek Zidlicky, and Pierre-Marc Bouchard on the sidelines. Forwards: Alex Tanguay, Simon Gagne, R.J. Umberger, Ryane Clowe, Alex Steen, Andy McDonald, Mike Fisher. Defensemen: Brent Seabrook, Ian White, Radek Martinek, Michal Roszival, Carlo Colaiacovo. Goalie: Steve Mason. Story: You’re probably already sick of reading about Crosby’s collision with then-Capital David Steckel and hit by Lightning d-man Victor Hedman, so we won’t elaborate on it. Sid’s comeback from those two hits lasted all of nine games. In the last game he played, he collided with the Bruins’ David Krejci and that is believed to be a reason of his latest concussion. He also collided with teammate Chris Kunitz, which as the National Post so elegantly said, “finished him.” It was revealed during All-Star Weekend that Crosby suffered a broken neck as well. The conspiracy theory is that the concussion he suffered back on Dec. 10 against Tampa Bay (in a collision with teammate Wayne Simmonds) hasn’t completely healed yet and that there might be some residual effects. Giroux did return after missing four games and put together a four-point night at Dallas on Dec. 21. But in the 13 games since then, just one goal (in the Jan. 2 Winter Classic) and eight assists. Story: The Washington Capitals first-half MVP, Nicklas Backstrom, was elbowed by Rene Bourque, who was later suspended five games by Shanahan for the incident (and beaten up by us video-game style). Backstrom has no timetable for a return, and the Capitals’ success and overall mobility has declined with him out of the lineup. The Caps with and without Backstrom are two entirely different teams. Backstrom’s health will likely influence George McPhee’s trade strategy come the deadline. Story: One of the scariest injuries in awhile, because of its seriousness and because of its effect on a player who has been a measuring stick for toughness. Chris Pronger was hit high by an errant Mikhail Grabovski stick. Right away, the injury didn’t look good with concerns mostly focused on damage to his sight. However, Pronger returned from what was called an “eye injury” and played six games. After that, he had a knee injury that required surgery, and it was only at this time that the Flyers organization revealed that he was suffering from post-concussion syndrome, and would likely be out for the rest of the season. Story: Kris Letang was injured in the third period of a Canadiens – Penguins game on November 25. He returned in that game and scored the OT game-winner, but missed 21 games afterwards. Though there was no penalty call on the play, Pacioretty was suspended three games by the Department of Player Safety. Story: Ryan Miller was hit by Milan Lucic in a race for the puck. Lucic was not suspended for the hit and only got two minutes of penalty time for charging. Later this season, Jordin Tootoo collided with Miller and was suspended for two games. The concussion Miller sustained after the Lucic hit was his second in a year. Forwards: Jeff Skinner, Martin St. Louis, Daniel Alfredsson, Milan Michalek, Danny Briere, Evander Kane. Defensemen: Zbynek Michalek, Joni Pitkanen, Marс Staal, John-Michael Liles, Victor Hedman. Goalies: James Reimer, Al Montoya, Rick DiPietro. Layout, graphics, and introduction by Ian Oland. Additional reporting by Ana Hansen.